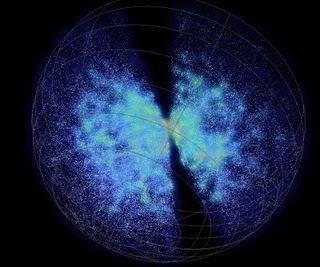 Using a measurement of the clustering of the galaxies surveyed, plus other information derived from observations of the early universe, researchers have measured the Hubble constant with an uncertainly of less than 5 percent. The new work draws on data from a survey of more than 125,000 galaxies. A PhD student from The International Centre for Radio Astronomy Research (ICRAR) in Perth has produced one of the most accurate measurements ever made of how fast the Universe is expanding. Florian Beutler, a PhD candidate with ICRAR at the University of Western Australia, has calculated how fast the Universe is growing by measuring the Hubble constant. "The Hubble constant is a key number in astronomy because it's used to calculate the size and age of the Universe," said Mr Beutler. As the Universe swells, it carries other galaxies away from ours. The Hubble constant links how fast galaxies are moving with how far they are from us. By analysing light coming from a distant galaxy, the speed and direction of that galaxy can be easily measured. Determining the galaxy's distance from Earth is much more difficult. Until now, this has been done by observing the brightness of individual objects within the galaxy and using what we know about the object to calculate how far away the galaxy must be. This approach to measuring a galaxy's distance from Earth is based on some well-established assumptions but is prone to systematic errors, leading Mr Beutler to tackle the problem using a completely different method. Published July 26 in the Monthly Notices of the Royal Astronomical Society, Mr Beutler's work draws on data from a survey of more than 125,000 galaxies carried out with the UK Schmidt Telescope in eastern Australia. Called the 6dF Galaxy Survey, this is the biggest survey to date of relatively nearby galaxies, covering almost half the sky. "This way of determining the Hubble constant is as direct and precise as other methods, and provides an independent verification of them," says Professor Matthew Colless, Director of the Australian Astronomical Observatory and one of Mr Beutler's co-authors. "The new measurement agrees well with previous ones, and provides a strong check on previous work." The measurement can be refined even further by using data from larger galaxy surveys. "Big surveys, like the one used for this work, generate numerous scientific outcomes for astronomers internationally," says Professor Lister Staveley-Smith, ICRAR's Deputy Director of Science.